After exploring Shanghai, China's largest city in November, Rob returned home inspired and bursting with renewed creative energy. This has encouraged him to experiment with new techniques creating some interesting and contemplative pieces. We hope that being open on the Bank Holiday will give anyone who is normally unable to visit, a chance to call in. I'm beginning the year in a very buoyant mood! My daughters are members of the youth sailing club which they both enjoy so it's a scene I'm very fond of and know well. Toddbrook is a friendly, welcoming club that builds children's confidence and fosters a sense of independence in a safe way. The reservoir is such a great asset to the area and the sailing club encourages a wide range of people to use the facility, be it through sailing, swimming or paddle boarding. Through the painting, I wanted to capture the activity on the water and reflect the changing light and seasons of this tranquil view through a mixed colour palette. 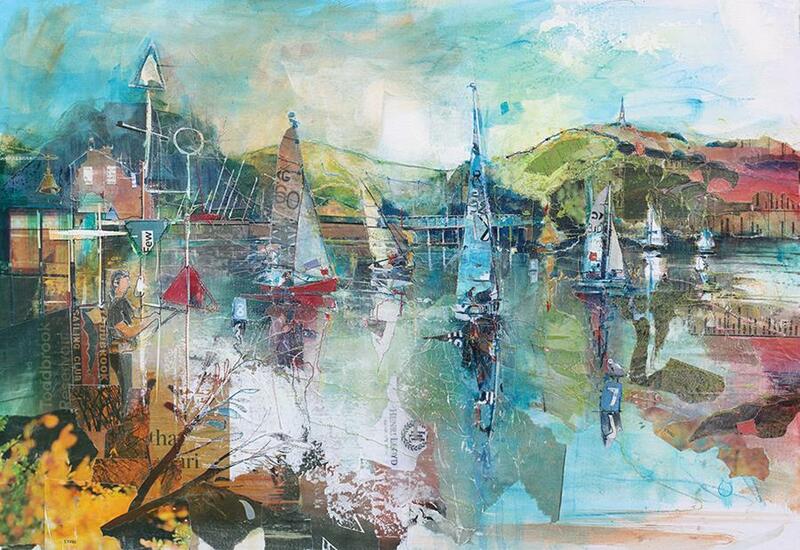 Parts of printed material combined in the painting include the Toddbrook Sailing Club Logo and the Henri Lloyd Logo - as Henri Strzelecki (co-founder of the sailing clothing brand) used to sail at Toddbrook. 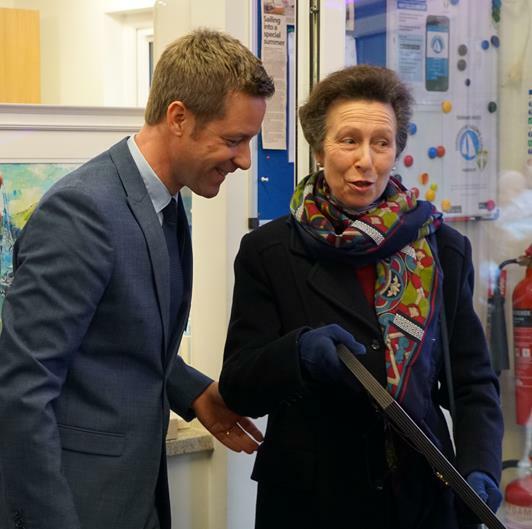 The result of this culminated in a very special visit from HRH Princess Anne to celebrate the club's 60th anniversary. 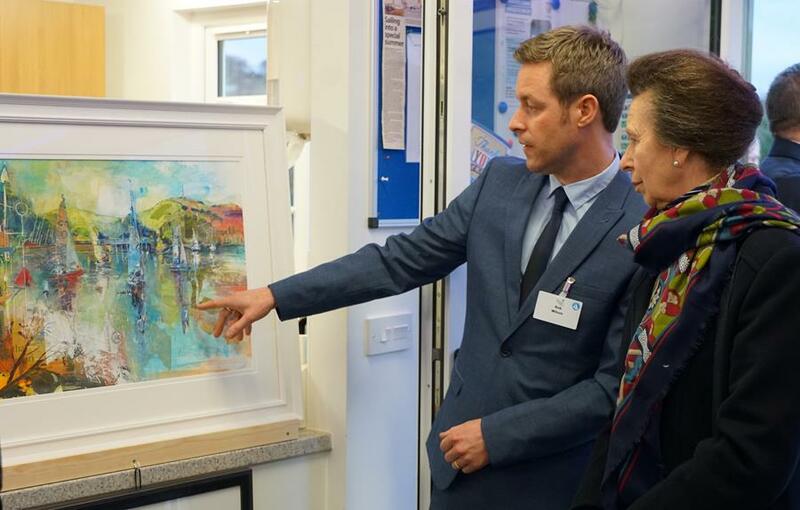 She's seemed very interested in the original artwork and it was a real honour to present her with a framed print of the finished painting. Alongside limited edition prints, the original painting is now available to purchase. More information. Next, the challenge to portray the courageous voyage of a 70-foot yacht race as they battle the elements during this epic round the world voyage. 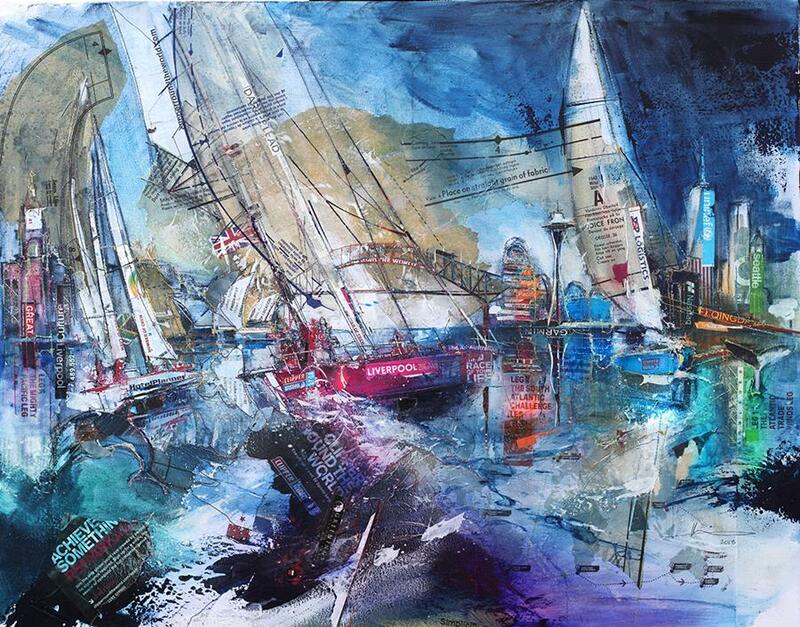 The commission from a family to celebrate their son's experience of this epic voyage. It was the interesting account of this challenging race that inspired me, as I tried to encompass some of the excitement and peril faced by the crew during this awesome journey. We decided to incorporate some of the iconic landmarks they visited on route along the horizon in the painting. After my amazing trip to Shanghai, I'm now embarking on some new paintings starting with the memories of a walk down alongside the memorising spectacle of The Bund. Lit up in gold, the imposing art deco buildings comes alive after dark. A really dramatic display of colour and light! Looking forward to seeing what such a cultural experience brings out in my art. With your continued support, I'm really looking forward to 2019. Brand new paintings taken from suggestions on favourite locations which I hope will appeal to all. This show is becoming a firm favourite to brighten up your winter walls. I'm proud to announce a new collaboration with the National Trust. 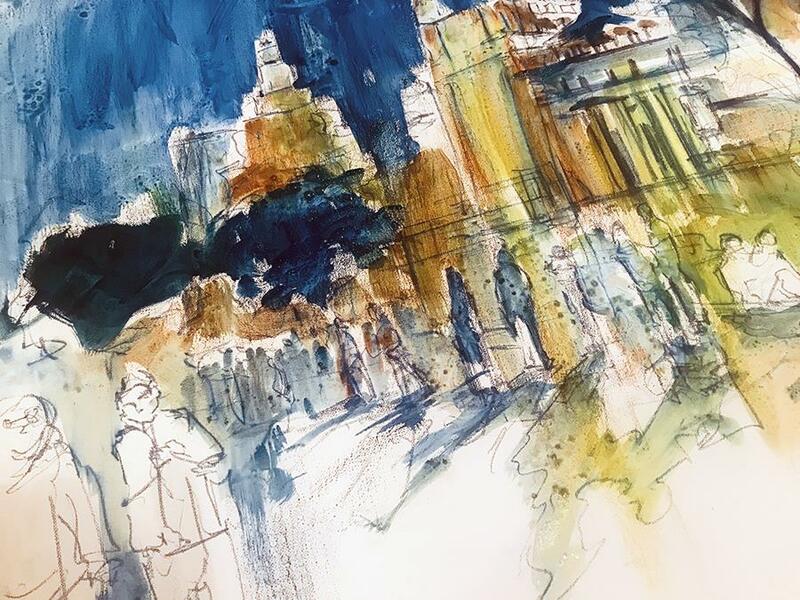 This will feature paintings of some of the most classical, historic buildings in the North West including Lyme, Styal Mill, Dunham Massey and Speke Hall. November takes me further afield with an exciting commission in Shanghai! I will spend a week exploring China's largest city with the aim to capture all it's vibrancy and culture. A huge congratulations to 'digitalprinting' who have produced my collection of three books and designed a bespoke Magnetic Box Set. Their entry has made it through to the final round of this years Print Week Awards. This signed charity print is now available to order, at a special price and for a great cause. All sales will help the Thomas Theyer Foundation reach their ultimate goal - to fund a brand new lodge at the White Hall Outdoor Education Centre, providing respite breaks for young people with additional needs. Preview evening on Friday July 13th, 6.30 - 8.30pm. Admission is free. See exhibitions for more details. Below is a timelapse movie of the recent painting 'Last Light'. Capturing this fantastic view of Tower Bridge as the day draws to a close and the shadows extend, enjoyed by those on a view relaxed evening stroll. Below is a timelapse movie of the recent painting 'Sightseers'. An early morning view across to Westminster as the groups of tourists start to descend. Recently, a local landmark, near Bollington became a focus, as the famous ‘White Nancy’ set on the hill, was adorned with the Manchester Bee. With the City in the distance, the view was overlaid with a tempestuous sky. I felt that the sky reflected recent events in the City, and so was inspired to go home and paint. It seemed very fitting to link this piece with a Manchester charity, in support of the City that I so love and admire. It's a place that has provided me with so much inspiration over the years. My chosen charity is ‘WE LOVE MCR CHARITY’, as its aim is to support and improve the lives of Manchester people. The print of White Nancy is on sale now, with 50% of profits going directly to the charity. Available in three sizes, the 95 limited edition prints are available to order directly from this website, to order click here. Thanks to everyone who attended the Reading Contemporary Art Fair and helped make it such a success. Please see Exhibitions for more information on this year's exhibitions and shows. Artwork featured on 'NorthWest Tonight' on the final day of the the 3rd Test! Captured on SkySports during Day 3 of the Ashes at Old Trafford. Nice commentary from Bumble!